Munich - Long established as a global brand and currently closing the gap on UEFA's top-rated leagues in Spain and England at a relentless rate, the Bundesliga is attracting fresh talent from around the world in unprecedented numbers these days. A welcome adjunct to the German professional game's own flourishing youth academy system, the influx of foreign players has taken the odd unanticipated turn, a prime example being the success enjoyed of late by players arriving from the Far East. And while the wave of Japanese imports following in the wake of former Borussia Dortmund star Shinji Kagawa has been garnering the most headlines, the Bundesliga's South Korean contingent is quietly expanding as well. That said, quiet is not really the word for the progress of poster-boy Heung Min Son at Hamburger SV. Son arrived in the Hanseatic port city in the tow of an arrangement between HSV and the South Korean FA in 2008 and made his debut in the senior team in the summer of 2010, as a prelude to being given a professional contract on his 18th birthday. Such was the immediate impression made by the young forward in pre-season preparations that his initial two-year deal was swiftly upgraded to four and Son has since more than done justice to that early show of faith in his ability. By inclination a left-sided attacking midfielder rather than an out-and-out frontman, he is nonetheless currently Hamburg's joint-top scorer in the Bundesliga on six goals, alongside Artjoms Rudnevs. Above and beyond his eye for the net however, the 20-year-old's speed, technique and all-round match intelligence look set to propel him into the major star league sooner rather than later. 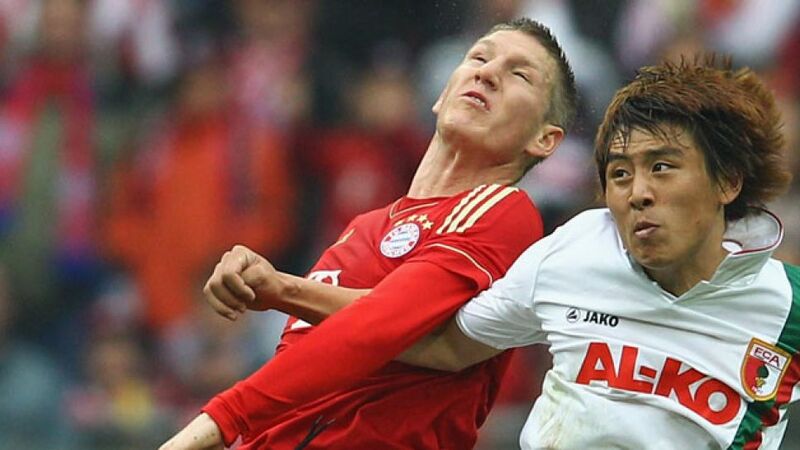 At 32, Fortuna Düsseldorf's Du-Ri Cha is meanwhile the elder statesman of the Bundesliga's growing crop of South Korean players. The son of ground-breaking former Eintracht Frankfurt and Bayer Leverkusen favourite Bum-Kun Cha, the 65-time international joined the Bundesliga returnees from Glasgow Celtic last summer. Cha's appearances to date have largely been off the bench but his experience, diligence and versatility - he's a nominal midfielder who can also be deployed either front or at the back in a pinch - could well prove invaluable to Fortuna when the going gets tough in the months ahead. Life is already a struggle for FC Augsburg though and the team from Bavarian Swabia now have two South Koreans on the books to help them try and scramble clear of the relegation zone. Ja-Cheol Koo swapped Jeju United for VfL Wolfsburg in the winter of 2011, but has spent the last calendar year at Augsburg on an extended loan deal which runs until the end of the season. The 23-year-old midfielder, who was calling the shots for the South Korea team that won a bronze medal at the London Olympics, has been a key performer in a testing campaign for FCA and the club are hoping that he can link up to good effect with compatriot Dong-Won Ji, freshly arrived from AFC Sunderland on a half-season loan arrangement. Like Koo a cornerstone of that successful Olympic select, 21-year-old striker Ji should bring some welcome additional firepower to an Augsburg side who mustered a paltry twelve league goals over the first half of the campaign. The one club currently below Augsburg in the standings, SpVgg Greuther Fürth, have also secured the services of an exciting South Korean prospect, albeit one yet to make his mark in the higher echelons of the game. 18-year-old left-sided attacking midfielder Jung Bin Park, signed up by the Franconians on an initial loan deal from VfL Wolfsburg, could well get his chance to do just that though in the months ahead. It will certainly be no small challenge, as the Clover Leaves battle to prevent the abrupt termination of their first stab at life in the top flight. Park has vowed to "give it his all" when called upon - and in that regard, in common with his fellow countrymen, he is likely to be as good as his word.